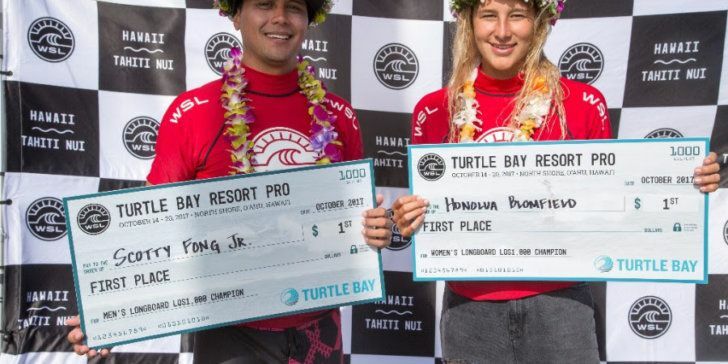 Scotty Fong Jr. and Honolua Blomfield, Turtle Bay Resort Pro Longboard winners. HALEIWA, Oahu/Hawaii – (Tuesday, October 17, 2017) — The final day of the Turtle Bay Resort Pro, a World Surf League (WSL) Hawaii/Tahiti Nui event, highlighted a blend of progressive maneuvers and classic noseriding as winners emerged in the Men’s and Women’s Longboard Pro division. 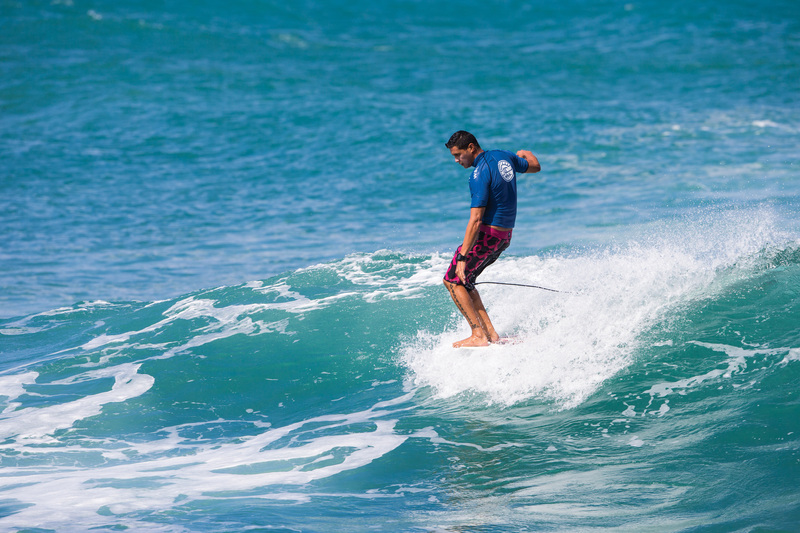 North Shore’s Honolua Blomfield and Honolulu’s Scotty Fong Jr. strengthened their bid into the World Longboard Championships next year at Papua New Guinea and increased their year-end rating, Fong Jr. with a third and Blomfield with a first in the region. The Women’s division saw Blomfield go against best friend Kirra Seale (HAW) in the Final along with Encinitas’ Kaitlin Maguire (USA) and Kelta O’Rourke (HAW) and score the best wave of the heat, a 7.17. The silky-smooth surfer cross-stepped her way to the nose of the board and remained in the pocket of the wave to hang five, then powered out a couple of even-tempo cutbacks to take the lead from Seale, who secured an early 6.07. Maguire’s best ride was a 5.0 for a beautiful noseride and a couple of turns above the foam, but both she and O’Rourke were unable to find necessary backup scores to overtake the heat leaders. Blomfield is an accomplished surfer at the young age of 18 and placed third in the world after a Semifinal finish at the Kumul PNG World Longboard Championships in Papua New Guinea this past March. She will return again in 2018 in her campaign for a World Title. This was Seale’s first professional competition with the WSL and she was ecstatic to earn a runner up finish behind Blomfield. 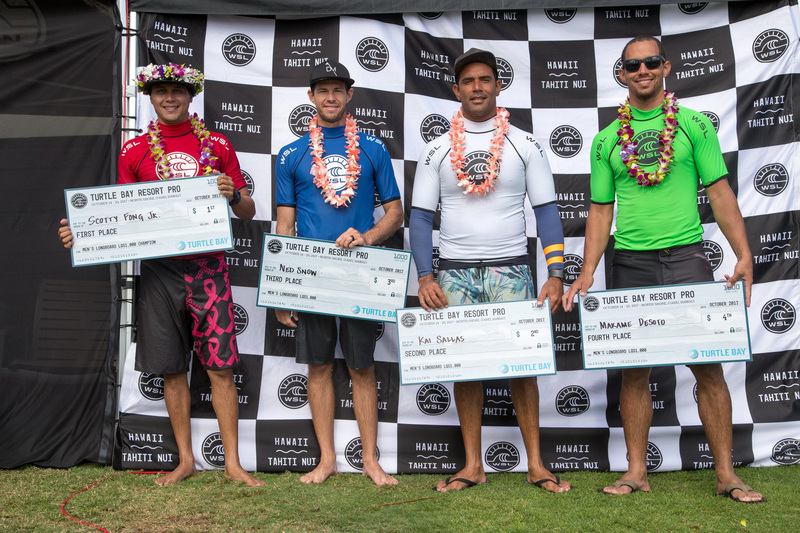 On the Men’s side, Fong Jr. displayed progressive surfing and fast footwork against fellow finalists Kai Sallas (HAW), Ned Snow (HAW) and Makamae DeSoto (HAW). He found the only barrel section of the event and scored a 7.83 from the judges, making him hard to catch after backing this up with a 6.07. A commercial airline pilot by trade and surfer by hobby, Fong Jr. looks forward to greater competitive opportunities next year as the WSL Longboard Tour strengthens. DeSoto, who placed fourth in the event, is the top placing surfer on the WSL Hawaii/Tahiti Nui regional Longboard QS after today’s competition.